The problem may reside with the people we serve. Perhaps they have hardened hearts. They may be enslaved to addictions or faulty belief systems. They may be spiritually immature or biblically illiterate. But, it could simply be an issue of readiness. The problem may lie within ourselves as leaders. We may have timid personalities. We may have a more task-oriented than people-oriented temperament. We may relish being behind-the-scenes rather than upfront in the spotlight. We may not feel qualified. We may find communication challenging for a variety of reasons. If we are going to rise above our personal insecurities or the obstacles and walls others have built in their lives, we need to find confidence in something, or should we say, Someone, greater than ourselves. After commissioning His followers to make disciples, Jesus said, “surely I am with you always, to the very end of the age” (Matt. 28:18-20). 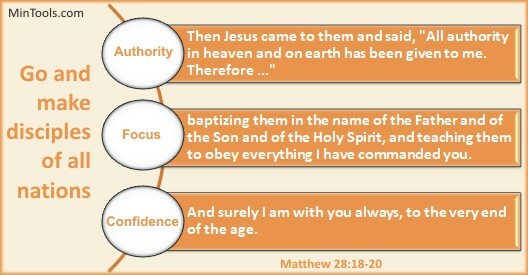 Jesus’ presence provides the needed confidence in communication. Lo, behold. What’s about to be stated should be attention-getting, something that will make a difference. Wherever we go and in all we do, He is with us. Notice the lack of conditional qualifications. Jesus is the same yesterday, today, and tomorrow. As He was with and helped the disciples of old, so is He with us today. We can count on His presence at all times, now and for the rest of our lives. Jesus, the One with all authority, all wisdom, and all power, is with us ALWAYS. Therein comes the confidence we need no matter how difficult it may seem. We are not alone. It’s not up to us!